So, who was he, then? 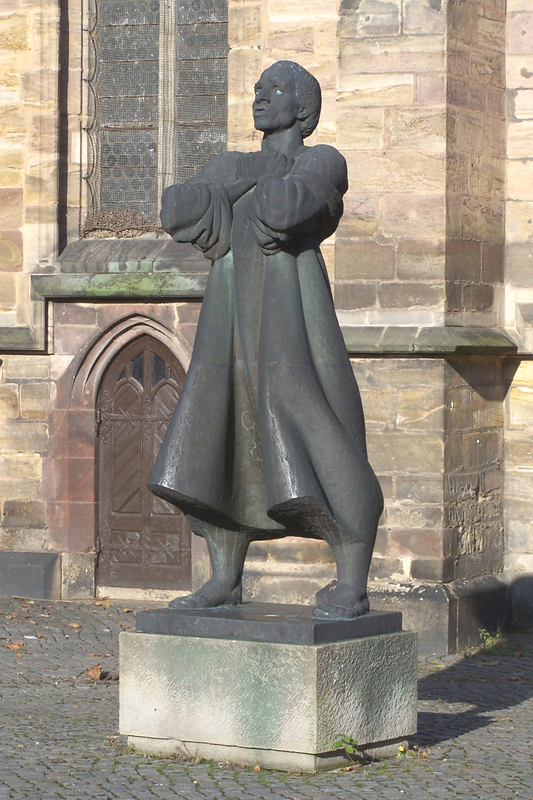 Born in 1489 in the Harz Mountains of Germany, Thomas Müntzer was a contemporary of Martin Luther. Like Luther, he worked tirelessly to sweep away the old corrupt and discredited Roman church, and build a new one fit for Germans. Like Luther, he called for a new interpretation of the Bible. There, the resemblances end. 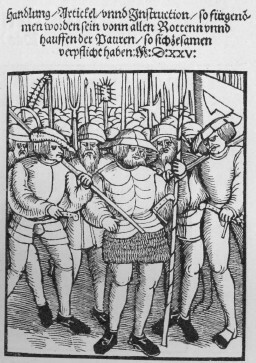 In the tragic unravelling of the brief and bloody Peasant War in Germany, Müntzer died on the executioner's block in May 1525. He had made the mistake of siding with the discontented peasants and townspeople of Germany. He had tried to push the Reformation further than it was supposed to go. For that, he earned the hatred of the German princes (both Lutheran and Catholic) and most especially of Luther himself. For 500 years, he has provoked detestation and admiration in almost equal amounts. It took historians almost 450 years to even begin to understand the complexity of the man and his teachings. He has been seen as an early Communist and a people's hero - for both roles, praised and vilified. In the past 100 years, he has inspired at least 150 novels, poems, films and other artistic productions. In the past 60 years, over two thousand books, articles and essays, mostly written in German. 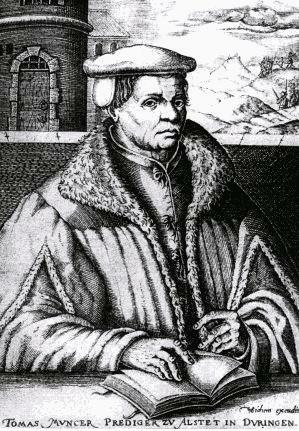 As part of the current website, I have built an extension solely for Thomas Müntzer. There you can read about him to your heart's content. Click here to access those web-pages. Of course, you may stay here and idle and read the summary below - but I promise that the full edition will much more enlightening. The life of Thomas Müntzer was brief. When he died on the executioner's block in 1525, he was only 35 years old. His role in the Church reform movement in Germany spanned the last eight of those years. Into those last eight years he managed to cram a life of tireless activity which brought him into conflict with feudal authorities and town-councils alike, regardless of the religious loyalties of each. Indeed, he more frequently found himself challenging the Reforming auithorities than the Catholic ones. After his death, his influence lived on in small local sects of spiritualists and Anabaptists. His main area of activity was the central German region of Thuringia, although he also spent time in Prague and on the borders of Switzerland. During his adult life, he rarely spent more than a year in any one place. He is best-known for his agitation and preaching in the small town of Allstedt, and then in the Imperial City of Mühlhausen - seen here on the left. Remarkably for one whose life was short and who was universally regarded as an agent of Satan by the authorities, all of his published writings (nine in total, over two years) have come down to us; even more remarkably, so have around a hundred of his letters and other drafts. From these we get a vivid glimpse into the mind of one who sought to use spiritual belief to overthrow the social and political structures of the 16th century. Here on the left is the title page of his 'Highly Called-For Speech of Defence and Answer to the Spiritless Easy-Living Flesh in Wittenberg who has Sullied poor Christianity by the Falsification and Theft of the Holy Scriptures' (no prizes for guessing what he thought of Luther, then!). Here on the right, a facsimile of a letter he wrote to the people of Allstedt, just prior to the final battle of the Peasants War. Click here to read more about his writings. It is fair to say that Thomas Müntzer's legacy is one much fought over. On the one hand, amongst his supporters, there are the radicals and socialists who - quite justifiably - claim him as an early revolutionary; also among his supporters, the ecclesiastical historians, who point out - quite justifiably - that his reforming initiatives were of equal importance as those of Martin Luther. In the camp of those who disapprove - sadly for them, not an easy position to maintain - his thoughts are considered phantastical and his teachings absurd. But his legacy speaks for itself: in the immediate aftermath of the German Peasants War of 1525, the 'sect of Anabaptists' sprang up - and one of their oft-cited heroes was precisely Müntzer. The Anabaptists continued to be a major thorn in the flesh of the Reformed Churches for several hundred years. 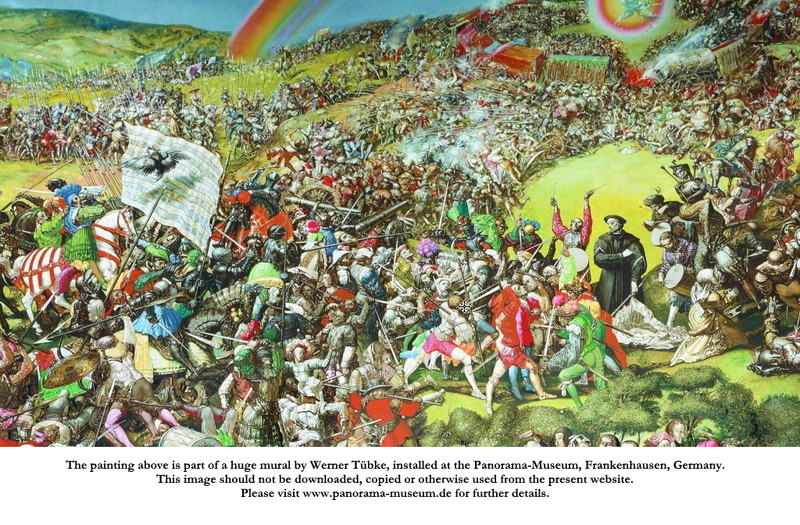 So - on the one hand, a spiritual and doctrinal legacy; and on the other, a political and revolutionary legacy, for Müntzer is regarded rightly as an early fighter for the downtrodden and the oppressed. The Müntzer website contains a large bibliography of works on the man. There is also a page for recommended reading - aimed primarily at those of you who cannot read German. There are a respectable number of publications in English and translations of some/all of his works: you will find the references on the relevant web-page.